WCNYC 2015 Speaker Slide List! One major regret I have this year is not doing enough research on who was attending WCNYC beforehand. There were some awesome people that I already follow on Twitter and missed them completely because I wasn’t aware enough. Next year, I’m definitely going to make a list of people to find and say hello to. My other regret is not having business cards. That one’s pretty self explanatory. I’d definitely thought about it in passing a long time before the event, and once that weekend rolled around, I realized I was completely unprepared. I even entertained the thought of lollipops, but changed my mind. Lastly I really need to remember next year to wear my contact lenses and grab the good seats early. I had trouble seeing slides even if I was fairly close. It was usually the slides with huge chunks of code and in rooms where the lights were on that were the least visible for me. Being hard of hearing, sometimes I had to choose between sitting on the side of the room where I could “see” the slides versus sitting on the opposite side to “read” what the speaker was saying from the stenographers. Speaking of stenographers, one really awesome thing about this year’s WordCamp was the stenographers! Even though I had trouble seeing, I could at least count on “hearing” thanks to them and I’m very grateful for that. So a few notes to my future self, and fellow WordPressers who may attend next year. Bring business cards, create a list of awesome people to meet, and try to put yourself in the most ideal seat to enjoy the speaker’s talks. You may miss some things, but either the stenographers will make up for that, or you can see if the speaker posts their slides online. Speaking of that – that list of slides is coming up, but first, what’s changed since I attended WordCamp last year? In last year’s post about when I went to WCNYC, I mentioned not being as social as I should’ve been. I was being modest when I said that. Let me be really honest here. People scare the living daylights out of me. Some people get their “I’m gonna die, but this is kind of fun” feelings from activities like bungee jumping or parachuting out of planes? Well, I get those feelings when approaching new people for the first time – especially if said new people are well-known members in the dev community. This isn’t normally an issue for me, but I confess to slacking from my physical and mental health routines in recent weeks. It definitely caught up to me. I think I grinned so hard throughout the day to appear “normal” that my face might’ve looked like it was going to split in half. 🙂 Luckily for me, there are others out there who understand those feels. This year I made it my mission to talk to awesome people. It only got easier the more people I met. I had the pleasure of meeting Josh Pollock, Shawn Hooper, Helen Hou-Sandi, Taylor Lovett and John Eckman. I also caught Beth Soderberg after her talk to ask for her twitter handle. Mission accomplished this year! Last year RachieVee didn’t exist! It was after the 2014 event that RachieVee was born. So one of the most rewarding feelings was meeting with people who knew about my blog at WCNYC. Even better? Some are linking out my blog posts in their talks! RachieVee has definitely been an effort for me and seeing that effort paying off – it feels great. I might’ve gone around hugging people if it weren’t for professionalism and mental health levels dipping lower than usual. What? You like my blog?! Can I hug you? Another major thing that changed from last year was my “position” in the WordPress community. Last year I was another anonymous developer working an in-office job at a startup. Since then, I became more active on WordPress support sites in addition to writing here on RachieVee. I’ve got over 200 followers on Twitter now. I’ve had some personal changes and work environment shifts while discovering who I was as a person and as a developer. Those changes and my love of WordPress landed me in a job that has been the best fit for me thus far in my career. It’s been so amazing to see how much my life has changed from that last WordCamp. I can’t wait to reflect next year as well to see how far I’ve come and how my passion for WordPress has grown. Okay, that’s enough about me. Time for the goodies! There were a lot of good talks scheduled that weekend. I unfortunately didn’t have the power to clone myself, so the next best thing was to find the slides that the speakers used during their talks! 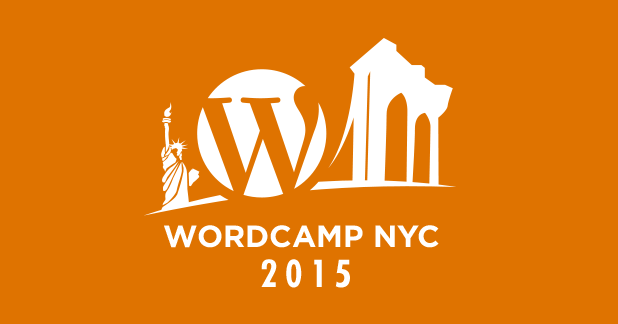 Since it’ll take some time before the WordCamp NYC 2015 videos get to WordPress.TV, you can get a taste of the event ahead of time with this list. It’s not all of them, but it’s what I found from the speakers sharing online. Here they are in one place. If I’ve missed any, feel free to let me know so I can add them. The left side is linked to the speaker’s WCNYC 2015 profile. Enjoy. David Laietta Hooks, Actions, and Filters, Oh My! It was a pleasure meeting you in person Rachel. I’m glad you had a great time at WCNYC this year, and if you follow your tips from this post, you’ll enjoy the next one even more! Finally, thank you for sharing the slides links. Much appreciated. I’m definitely going to have a business card next year – it was great meeting you. And no problem. Thank you for sharing your slides online for others to learn from. Thanks for doing this Rachel! As well as thank you for including me in your list of slides as well. Hopefully next WCNYC (or maybe before that) we’ll get a chance to meet. No problem! Thanks for sharing so that others can experience some of your talk even if they didn’t attend. Looking forward to meeting you in person some time. So happy you enjoyed it! Free free to email me directly with any questions.